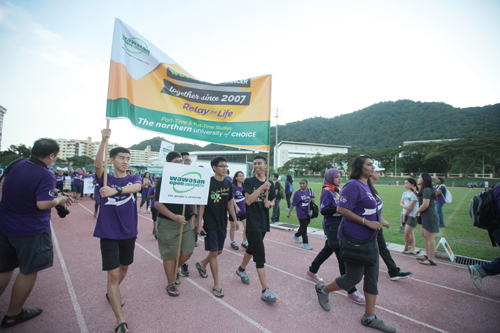 Wawasan Open University (WOU) extended its support for the 11th consecutive year to Relay for Life Penang, which was organised by the National Cancer Society of Malaysia (NCSM) Penang branch and the Penang Hospice Society. WOU Corporate Communications Manager Rasidah Mion (left) presents the mock cheque to Dato' Seri Dr T Devaraj. The Relay was held today for the first time at Athletics Stadium, Universiti Sains Malaysia (USM), representing a change of venue from the Penang Youth Park. WOU, in a show of support, was a silver sponsor and also sent a team of about 15 participants, comprising staff and full-time students, to join the walkabout. The aim of the annual event themed ‘Fighting Cancer Together’ is to create awareness on cancer, remember loved ones lost, celebrate survivors, and raise funds for the fight against cancer. The full-time students of WOU hold the banner high as they participate in the walkabout. WOU participants carried placards and a banner declaring the University’s support to the Relay since 2007 as they joined the survivors and other teams to walk around the stadium’s track. Some survivors had come from as far as Johor Bahru, Melaka, Kuala Lumpur, Ipoh and Taiping. 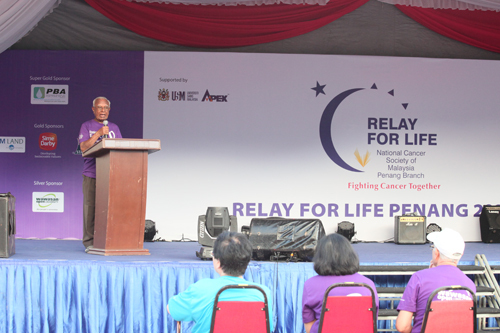 In his speech earlier, NCSM Penang Chairman Dato’ Seri Dr T Devaraj informed that this is the 13th year of celebrating the Relay in Penang to get people “to recognise that cancer is a burden and this burden can be reduced if all of us can work together, especially by leading healthy lifestyles”. Dr Devaraj welcomes the sponsors and particiipants. In launching the Relay, USM Deputy Vice Chancellor (Industry and Community Network) Prof Dr Abdul Rahman Mohamed, quoted Malaysian statistics to state that “the risk of males getting cancer is 1 in 10 and for females is 1 in 9”. Cancer contributed to 14% of total deaths that occurred in Ministry of Health hospitals in 2015 and is reported to be the third common cause of death in Malaysia, he added. “The best way to fight cancer is primary prevention through changes in lifestyle, which include not smoking, following a healthy diet, regular exercise and decreasing exposure to carcinogens. The best way to survive cancer is early detection through regular screening and checkups. Once diagnosed, remember that many of these cancers are curable,” he stressed. Prof Abdul Rahman calls on the crowd to make healthy lifestyle choices. The event featured music, henna/face painting, entertainment, games, food stalls and exhibition to lend a mini carnival atmosphere for the enjoyment of the young and the old. Full-time students with WOU staff that include (from right) Assoc Dr Ramesh Chander Sharma, Kevin Tan, Chew Bee Leng (hidden), K Ranjini, Rabikha Hasni Suparman, Lim Yeang See and Sharon Alice Wiessy.